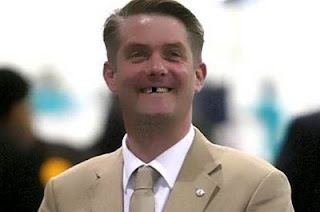 Since Richard Barnbrook was elected as a BNP member of the London Assembly last year, his impact has been almost nil. Those worried about the raised platform now being given to Nick Griffin would do well to take a look at the case of his colleague on the London Assembly, Richard Barnbrook. When he was elected amid much hand-wringing last year, we were repeatedly warned of the threat that he would bring to the democratic process in London. Hundreds of protesters gathered outside City Hall to mark his arrival and politicians and members of staff all warned of a boycott of the BNP man. Boris Johnson said that he would not speak to him directly, and even reportedly drew up a "coping strategy" to deal with the Barnbrook threat. So overblown did it become, that for his first meeting in the assembly, a one-chair gap was placed between him and the other members. Yet for all the media fuss kicked up in those first few weeks, Barnbrook's political impact since then has been remarkably close to nil. He entered City Hall with big promises to sweep the "nonsense of political correctness" from London politics. Yet apart from being told off for eating a banana, taking photographs of himself in silly outfits, and being suspended for inventing murders, Barnbrook's year has been a complete non-event. At Mayor's Question Time he is reliably useless. His questions are so long-winded, and his wit so slow, that he will often use up all of his allotted time before the mayor is even able to answer him. His press releases (all three of them) have been completely ignored by London's media, and his one attempt to organise a rally of the city's youth resulted in not a single young person turning up. Like Griffin, he has appeared on BBC discussion shows but, unlike Griffin, his appearances have all gone completely unremarked. And after all that hard work, the BNP's vote in London actually went down at this year's European elections, from the level needed to elect him to City Hall. And as the hopelessness of their Great White Hope has dawned on BNP supporters, they too have gradually drifted away from their one-time star. His assistant and cameraman Simon Darby has now left him for Brussels, and his band of supporters are now rarely to be seen within City Hall. His once-regular YouTube videos appear to have finished, and his campaign to become MP seems highly unlikely to take off. So, as the nation rises in indignation after Griffin's appearance on Question Time, we should all think again of the sad case of Richard Barnbrook. Because, ultimately, there is a reason why the BNP still only gets 6% of the vote nationally, and it has very little to do with the lack of publicity for the party and its views.